According to the special operations team that arrested Dumisani Gwala, he is the leader of KwaZulu-Natal’s biggest rhino poaching syndicate, and it is believed about 80 percent of the horns in the province go through his hands. To put this into perspective, KZN had the highest rates of poaching in 2015, after ‘ground zero’ Kruger National Park. An eight-month intelligence-driven operation culminated in Gwala’s arrest in December 2014. Using a reverse sting, crime intelligence officers from Pretoria gained his trust by selling him rhino horn on five separate occasions. The horns were supplied by Ezemvelo KZN Wildlife. In the final move, in the rural community of Manguzi (15km south of the Mozambique-South Africa border), a crime intelligence agent handed over a 5kg horn and received residual money from the previous sale. At that point a Special Task Team member jumped out of the boot of the agent’s car. The alleged kingpin attempted to disarm the Special Task Team member, severely beating and biting him, and then he got into his car and attempted to run him over. Back-up arrived and Gwala was arrested. 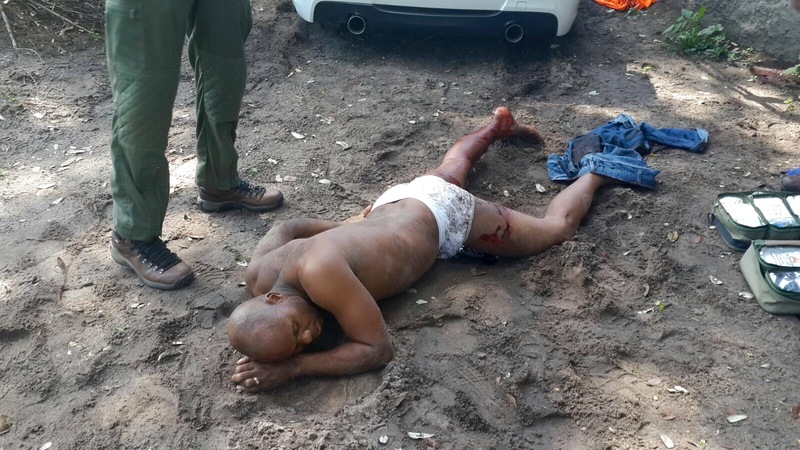 Photo: Alleged rhino kingpin Gwala on the ground after arrest. He was shot in the leg while resisting arrest. Gwala is brutal by nature, and widely known among poaching circles and law enforcement as a man that rules by the gun. There have been several cases against him before, but the cases have either been withdrawn, or the dockets have suspiciously gone missing. While Gwala claims he is unemployed, the Asset Forfeiture Unit seized six luxury vehicles from his premises worth millions; including a BMW X5 and a 3-series, a Mercedes Kompressor, a Toyota Land Cruiser and a Prada. When Gwala appeared in court, not only was he granted bail of a pittance R10 000 (US$600), but Magistrate Ngcobo released vehicles that had just been seized. South African Police Services (SAPS) immediately obtained a court order to repossess the vehicles, but when the Asset forfeiture unit arrived at his house to collect the vehicles, he stood defiantly at the entrance with a five litre container of petrol and threatened to burn all the vehicles if the officers came any closer. The officers left and he quickly stashed all the vehicles. Only one vehicle has since been recovered. Magistrate Ngcobo has a long history of letting off rhino poachers with a slap on the wrist or a small fine. Gwala’s defense attorney is Ngwenya, the same attorney that defends most of the poachers in KwaZulu-Natal. How these poverty stricken poachers can afford an attorney is still a mystery. Just last week Magistrate Ngcobo acquitted Warrant Officer Christopher Gumbi in the Mtubatuba Magistrate’s Court. He was originally charged with armed robbery, possession of rhino horn, and defeating the ends of justice. Warrant Officer Christopher Gumbi, of the Jozini police cluster, was arrested about one year ago after an undercover operation and months of surveillance. Solomon Makgale, spokesperson for national police commissioner Riah Phiyega, said Gumbi is alleged to have pointed his weapon at undercover agents posing as poachers, robbed them of two rhino horns, and fled without attempting to arrest them. Gumbi was later arrested with the rhino horns and his police service revolver was confiscated. South African criminal syndicates are working in conjunction with poachers from Mozambique, and the conviction rate of arrests are ashamedly low, often with poachers being let off with a small fine or a warning. This looting of our natural resources is just as much about humans as it is about animals, and if we continue to fail to prosecute these criminals, economies will collapse, causing more poverty and more conflict. 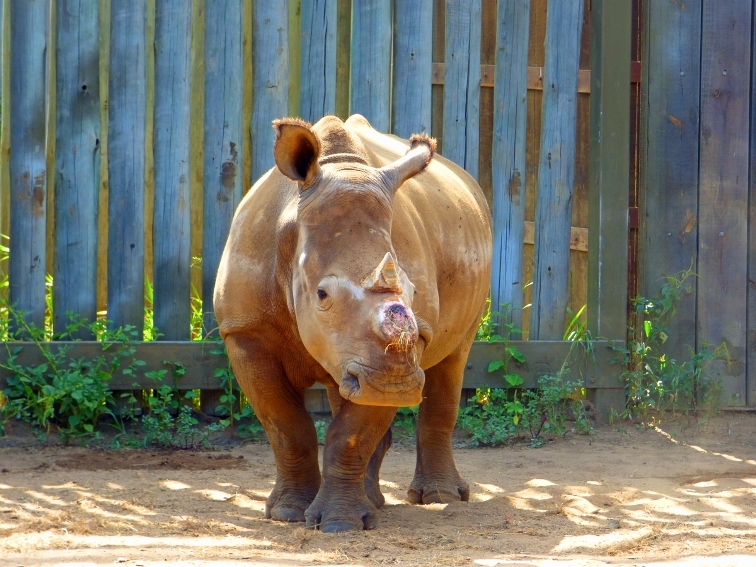 Photo: A rare survivor of the poaching crisis.